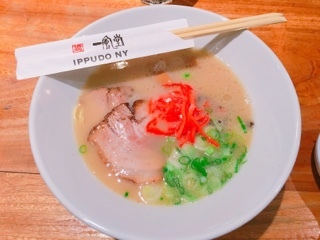 Search for the ‘best ramen in New York City’ and Ippudo generally is referenced somewhere. Hence, on a dreary rainy day, when a comforting bowl of noodles is all I yearned for, we arrived at the restaurant at 10:50 (it opens at 11) and found a line had already formed. As groups joined the queue, most looked nervous, wondering if they’d get a table and out of the rain. As it turns out, we didn’t have to worry as Ippudo’s dining room is spacious (seating at least 50) complete with a number of booths that hold large groups. Furthermore, their kitchen is a well-oiled machine so food arrives quickly. 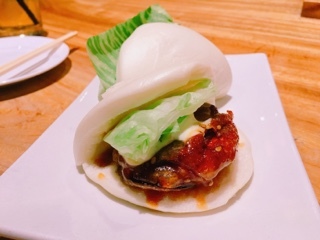 Their buns are a must-have item to start, the vegetable ($8) version were amazing combining a warm fluffy bao, crispy deep fried battered eggplant, and meaty slices of eringi mushroom. There’s a lovely softness, crunch, and sweet oily hoisin that melds together in your mouth. One just wasn’t enough. As the Shiromaru Hakata classic ramen ($16) is presented, you’ll be enveloped in a scent of pork and garlic. The tonkotsu broth is creamy and savoury without being oily or overly salty. The pork chashu has a nice meat to fat ratio and the pickled red ginger gives the dish an unexpected tangy kick. 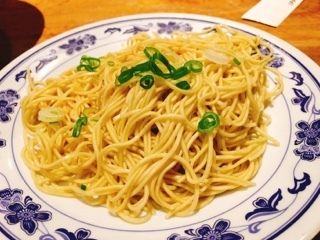 Eat the noodles quickly as they’re thin and the perfect springy texture at the beginning, even after a minute they begin to soften. Likely, the noodles won’t last long anyways… the ramen is heavenly. For the first few bites, I momentarily tuned out my surrounding environment and was one with the bowl. The umami filled broth and noodles were all consuming - I couldn't get enough. By the time I was halfway through, the experience just couldn’t end. Luckily, you can order more noodles ($2), in three minutes an additional portion will be brought over so you can dump them into the remaining broth and continue chowing down. In retrospect, the extra noodles were too much (a half portion would have been perfect), but the ramen was so good I didn’t want the meal to finish. In a world where we’re distracted by so many things, it’s rare to find something that commands you attention. 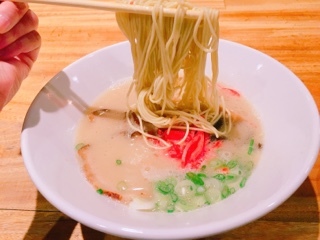 Eating as Ippudo helps to eat mindfully, call it a meditation for your stomach.